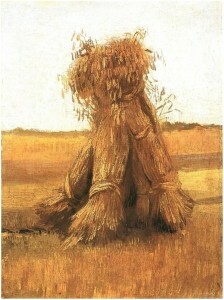 When you think of paintings of haystacks you frequently think of Claude Monet and his Haystacks series. However, Vincent van Gogh painted haystacks as well in his paintings, Haystacks in Provence (1888) and Haystacks under a Rainy Sky (1890). 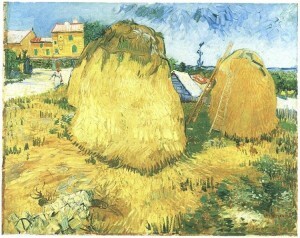 Along with the haystack paintings, throughout his career, Van Gogh created numerous paintings of wheat fields. 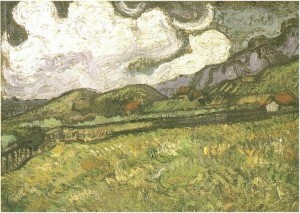 Some of these paintings can be used to see the progression of Van Gogh’s techniques over the years, from his early Sheaves of Wheat in a Field (1885) and Wheat Field with a Lark (1887) to his later works like Wheat Field Behind Saint-Paul Hospital (1889) and Wheatfield with Crows (1890). We see his paintings transform from the more drab colors and fine brushstrokes to the more colorful, with bold, dynamic brushstrokes. 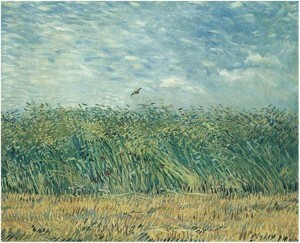 Some believe that Van Gogh’s paintings of wheat fields are symbolic of his connection to nature, his appreciation of rural laborers and his spiritual beliefs. 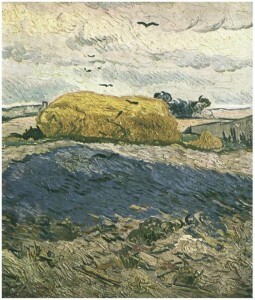 They say the wheat fields of his paintings represent the cycle of life. Still Life Paintings Using the Same Vase?